Rotary Root cutting is an effective and low cost solution for prolonging the life of drainage systems. It can be utilized for the removal of heavy root infestation; cement wash, lime scale and fat build up. The rotary root cutter is supplied with a high-pressure jet vac unit, which powers it along the line. 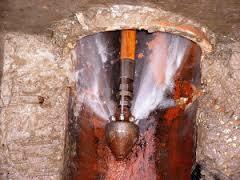 Once the blockage has been cleared, a water jet is used to remove all debris from the pipe. The result is effective and immediate cleansing with no damage being caused to the existing pipe work. The root cutters are capable of working under difficult conditions such as displaced joints and deformed pipes. Draintech provides highly skilled operatives ensuring that the work is carried out correctly, safely and to our client’s satisfaction.